Timing belts and timing drive tapes are designed to function with specialized timing pulleys to guarantee precise, cyclical transport of products. Conveyor belts manufactured for timing applications can be made with perforations to engage timing teeth on the pulley; they can also be made with attachments that engage pockets in the pulley’s outer circumference. The timing elements in either case are used only for timing and not motion generation. The belt movement is still generated by frictional forces between the belt and pulley surfaces. The team at Belt Technologies has the knowledge and experience to create custom timing belt solutions for virtually any automated conveyor belt application. Stainless steel timing belts are highly versatile and can be designed with specialized attachments for timing, positioning, and indexing. 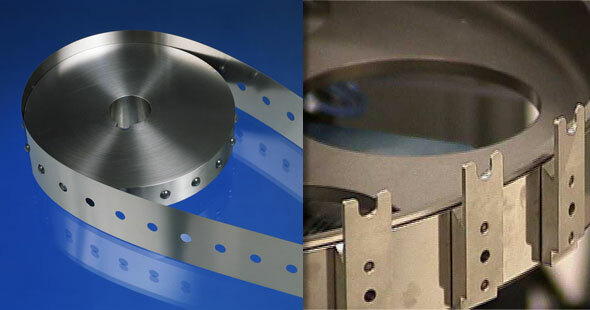 The unique properties of stainless steel give metal timing belts the same resilient properties as our flat metal conveyor belts, including a high resistance to impact, extreme temperatures, chemical corrosion, and vacuum environments. Repeatability is the ability of a single pitch to return to its home position (within a specified tolerance) after several belt revolutions. In a standard friction drive system, the pulley moves slightly faster than the belt. If left unchecked, this can cause pitch accumulation, or belt creep, that can negatively affect the accuracy of the system. Stainless steel belts do not stretch, so they are typically able to guarantee a repeatability tolerance between 0.002” (0.051 mm) and 0.005” (0.127 mm). Timing belts and timing pulleys further minimize the effects of belt creep, which makes stainless steel the best option for maintaining system accuracy in applications where precision is paramount. To find out more about our precision timing belts, timing drive tapes, and pulleys, contact the experts at Belt Technologies today. Learn more about the advantages of stainless steel timing belts.